12.12.2017. It was cloudy with a drizzle and we were on our way to the mall. Our car was moving slowly when we saw this tiny, grey furry thing scurried down the path and almost got hit by a car in front of us. It awkwardly inched away from that car, and almost got hit by yet another car, and this time it was so close that I screamed out loud. By this time, it was clear to us that the furry grey little thing was a kitten, which by then made a wobbly turn and sprinted towards our direction. Some securities saw the incident and one of them came close to check where the kitty is. He walked past our car, seemingly relaxed, so we assumed the kitty has made its own way to the bushes and we continued driving slowly to the lobby. That’s when a woman hysterically pointed to our car wheel, and two securities rushed to check it out. Can you guys imagine our horror?? ? We quickly got off the car, checked the front left wheel where the hysterical lady pointed at, and to our (endless) surprise, the kitty was there! We only saw its head tho, in-between the rim, for goodness sake. Thankfully it was still moving, but we were afraid its body got stuck in the rim because it seemed like it couldn’t get out of there. The securities tried to get it out, but their hands couldn’t reach it because the rim holes were too small for them, so I tried, very carefully as not to hurt the kitty. It was raining and the mall was playing the song ‘Hallelujah’, so I got a bit emotional and sobbed while I was trying, and finally, I managed to get it out – alive and well without a single scratch some more, thank God! ??? So if what they say is true that a cat has nine lives, then this kitty has just spent three out of them in just a few minutes. ? ? ? In the car, she (yes, it’s a female btw ?) just stared at me and maintained her adorable position in the cradle of my hands. I think she’s also really shocked with the series of accidents she got herself into. 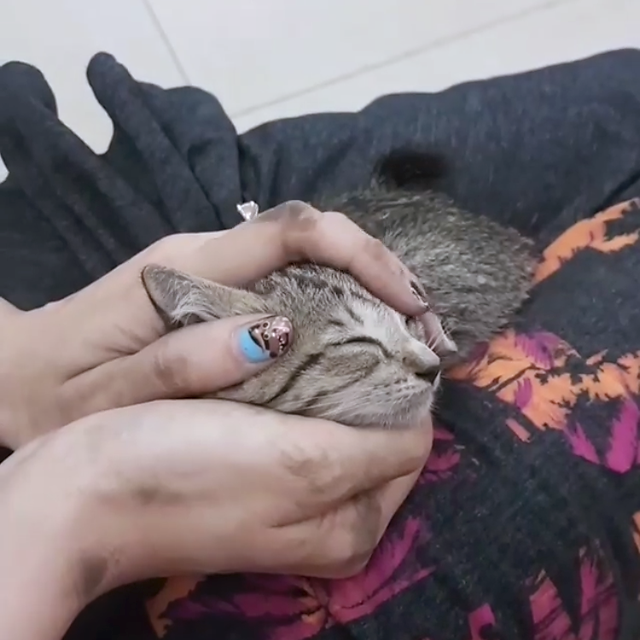 We quickly took her to the nearest vet to get her cleaned up and medically checked. The doctor said she’s okay *phew* and healthy. 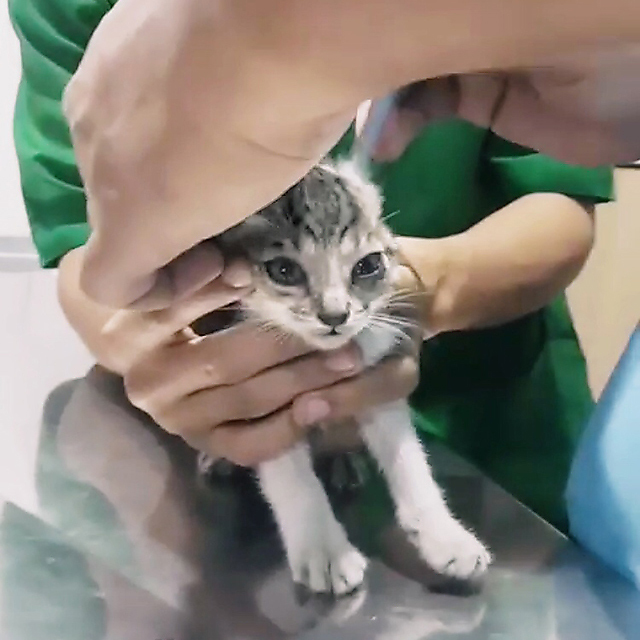 We were going to have her vaccinated right away, but doc said she’s still too young (1,5 month old), so she should at least wait for another month for the jab. Made her into a burrito! 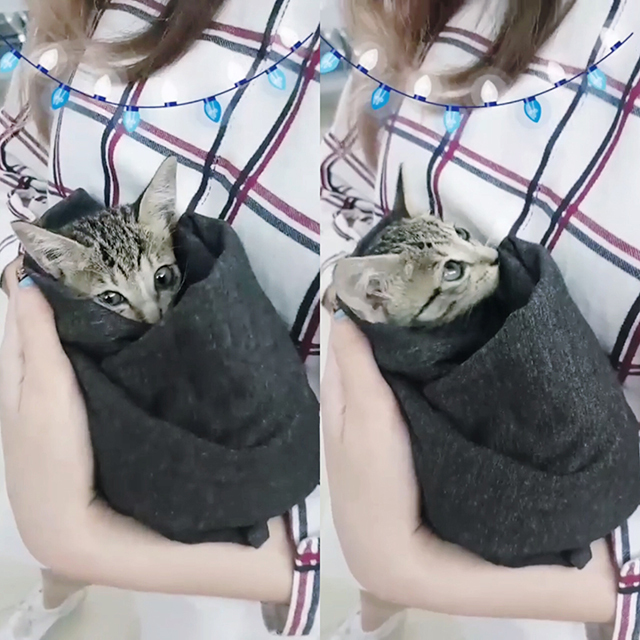 Or should I say… purrito? ? Anyway, here comes the sad part. We live in an apartment and *secretly* already have two cats with us: @boluthecat and @miikopanda. While we really want to adopt this cutie cat, we can’t because this baby wouldn’t stop meowing the moment we leave her alone. This could make us caught by our apartment’s security, and risk Bolu and Miiko getting extracted as well. Bolu and Miiko are very quiet, by the way, so they never got caught. *fingers crossed* ? Getting her back on the street is not an option as well, because as you can already tell from my story up there, this girl is just too careless and she’s definitely not made for the street. ?‍♀️ ? If you are interested to adopt her, please contact me via Instagram DM @jessyamada. Thank you so much for reading and hope you guys have a purrfect day! that kitten is so cute! you're so kind! <3 i hope there's a person who wants to adopt her soon. Its so fluffy and fragile! 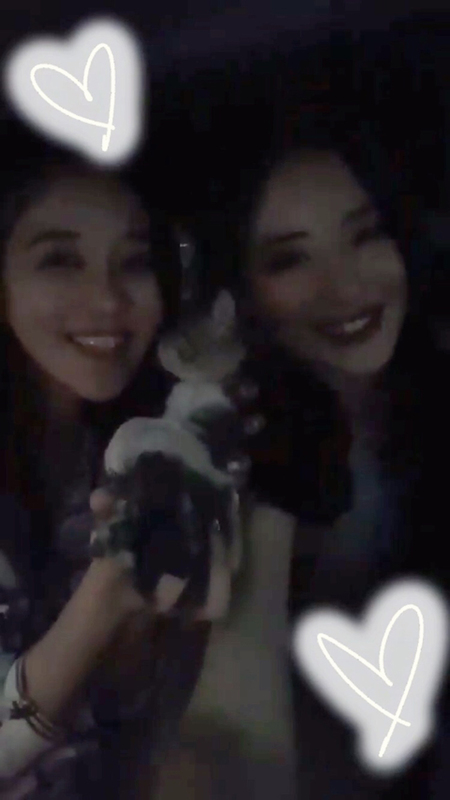 Hope this kitten will find her happy family soon! your car so lovely .